How did you get into loan syndications at a major Chinese bank? I got top grades at a top 3 business program in Hong Kong (HKU/HKUST/Chinese University of HK) and worked in corporate banking for multinationals at a major global bank before getting poached by a headhunter. Many people also worked in Canada or the US and then were recruited to Hong Kong – most of my colleagues actually. Do you need Mandarin to work in this job? Absolutely. There is no more room for people who get recruited from Oxford Cambridge and LSE without Chinese language. Now there are people recruiting from those schools and Ivy Leagues with fluent Mandarin. You will not be transferred in without Mandarin fluency without being VP or above with specialized skills, although smaller firms with regional representative offices may consider having you there just as a body. Although emails and contracts are Hong Kong law in English for the most part your due diligence process and all client correspondence in person will be conducted in Chinese. How much does a loan syndications associate make in Hong Kong? You are looking at around $100,000 USD per year, depending on the bank. Salaries are high at banks like CITIC and BOC if they were poached from a US/global bank like JP Morgan. We are seeing a lot of people who have worked at JPM/BAML/HSBC who deal with multinational clients – or even corporate banking overseas in North America and London – get snapped up over here for double the money. The higher up you are the more your pay will increase. You also get people in various banking roles here get asked by Chinese banks to go overseas, again for very good salaries such as Dubai. Corporate banking associate for a major Chinese bank had a posting that paid US$200,000 recently. Who leads the league tables in loan syndications in Hong Kong? Who are the major corporate banks? The major corporate banks are Bank of China, HSBC, ICBC (Industrial & Commercial Bank of China), CCB (China Construction Bank), BoCO (Bank of Communications), the Japanese Banks (MUFG, Mizuho, Sumitomo Mitsui Banking Corporation etc.) 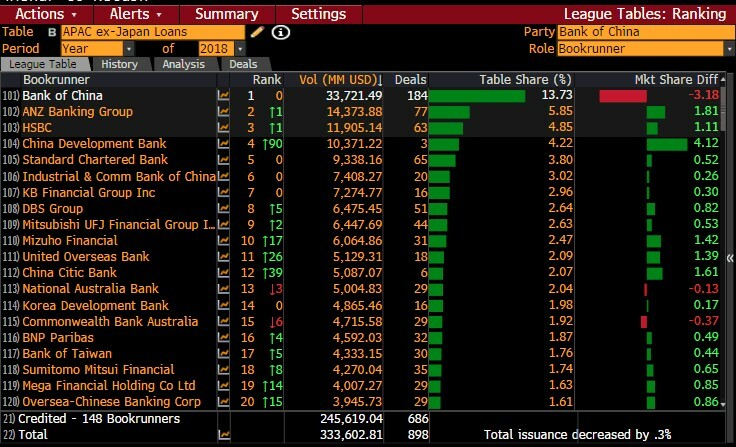 and ANZ – you may be surprised to see an Australian bank participating in so many mandates but they are by far the most Chinese oriented bank other than HSBC from the west. The US banks such as Goldman and JPM do not participate as much unless it’s supporting global clients because there is not a lot of associated capital markets activity like Equity Capital Markets and Debt Capital Markets. They cannot lend that much money because their cost of funds is expensive. They have to borrow to lend whereas the participants in the corporate banking market have either deposits locally or cheap deposits overseas like Japan. Also, capital markets activity for many corporates are done through Chinese and US investment bank joint ventures. This is changing however because China is beginning to liberalize the investment banking market and foreign firms can now have majority ownership. Who are the major borrowers? Chinese state owned enterprises? Multinationals? Private Chinese companies? The major borrowers in my division are local property companies, Chinese State Owned Enterprises (SOEs), and IT giants like BAT (Baidu, Alibaba, Tencent). Is there a commercial paper market in China yet? If not, what are the most common loan products – operating revolvers and term loans? The most common products are term loan and revolver, sometimes floating rate notes (FRNs). All debt is floating. What is the typical loan structure in HK? What is the normal pricing margin and do borrowers typically have upfront fees commitment or utilization fees? The typical loan structure in HK is a clean loan, or with asset, project, property collateral / leveraged buy out (difficult to explain because it varies case by case). The normal pricing margin depends on credit quality, all-in fees can be 75-500 basis points. The fee is comprised of the upfront fee and margin, and commitment fee during availability period. What industries are hot right now in lending and what is the use of proceeds? Hot industries used to be Chinese property giants like the Evergrande Group, which owns Guangzhou Evergrande Taobao and was the most leveraged stock in China. A lot of property companies in China were debt fueled rollups that the Chinese government is cracking down on now such as Anbang and HNA. Financials are hot and some are reinventing themselves as tech firms that collaborate with companies such as Ping An Insurance and their Good Doctor app. What are some typical covenants for borrowers that you work with? Is there any sort of sub investment grade market? Do borrowers have Moody’s or S&P ratings typically? There is no sub investment grade market that these banks will participate in, those companies are typically serviced by the shadow banking industry. Large corporate banks only lend to investment grade companies like the SOEs. Credit rating agencies like Moody’s and S&P are not in widespread use. There is a large junk bond market in China though – I would not touch it, especially as people speculate the government will allow a healthy level of defaults. What are hours like typically in syndications and do people take two hour lunches? Work hours are highly dependent on the bank you are at. Personally, I work on average from 9 to 7, and take 2 hrs lunches. My favorite lunch spots are cuisine cuisine at the Mira and occasionally Outback Steakhouse. Sometimes for lunch I will get in a big lift session at PURE, which is where rich people go to workout. Really rich people go to the jockey club. What other teams in capital markets do you work closely with, DCM, derivatives? What do they pitch? I do not work closely with DCM and derivatives. They pitch mostly Chinese companies, but the market is not as developed and integrated. It also is less tied to credit as you would expect elsewhere (cross-selling) as you tend to make acceptable return on equity and return on capital on the loans – they are drawn and pay good interest.